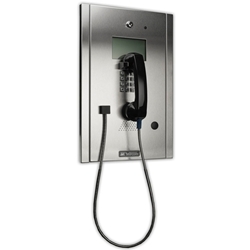 Mircom's TX3 Handset Electronic Directory Telephone Access Systems are designed to provide primary resident/visitor access control for condominiums, apartment buildings, office buildings, gated communities and industrial buildings with up to 2000 residents or users. The Continental Series enclosure is constructed of a heavy gauge stainless steel and is primarily designed for indoor applications. The Continental Series enclosures feature a handset, microphone, tamper resistant speaker and have provisions for a postal lock and camera to be installed.